Casting directors and agents in New York City often advise wannabe actors to create their own projects. That way, they can do the kind of work that they want to be doing. 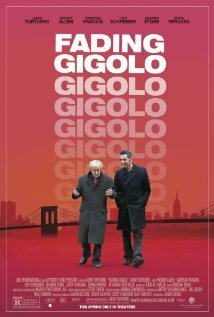 He wrote, directed and stars in Fading Gigolo, the story of a guy with money problems who, with the encouragement and salesmanship of a good friend — portrayed by Woody Allen — finds himself the hired lover of a group of lonely middle-aged women. It’s a great cast: Sharon Stone, Sofia Vergara, Liev Schreiber, and in a star-making turn, Vanessa Paradis (better known as Johnny Depp’s long-time-but-not-so-much-anymore girlfriend). The movie was very funny at times, and at other times, very serious and soulful. The changes in pacing and tone were unexpected and unexplained. I felt like I was watching two movies that didn’t quite gel, and there were jokes that flew over my goyish head that cracked up the rest of the art house crowd. That being said, I enjoyed the individual performances and getting glimpses of my Upper West Side businesses and doorways in this very New York City film. This entry was posted in Celebrities, Commentary, Entertainment, Humor, Movies, Religion and tagged actors, agents, art house theatre, casting directors, celebrities, commentary, do what you love, entertainment, Fading Gigolo, goy, hired lover, Humor, Jewish, John Turturro, Johnny Depp, Liev Schreiber, middle aged women, money problems, movie director, movie star, movie writer, Movies, New York City, pacing, religion, reviews, salesmanship, Sharon Stone, Sofia Vergara, tone, Upper West Side, Vanessa Paradis, Woody Allen. Bookmark the permalink.